Weather and climate extremes can significantly impact the economics of a region. 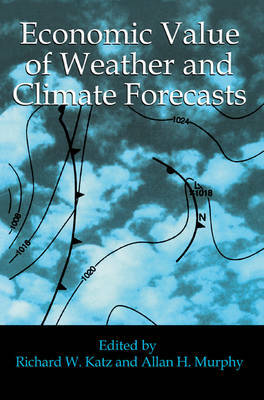 This book examines how weather and climate forecasts can be used to mitigate the impact of the weather on the economy. Interdisciplinary in scope, it explores the meteorological, economic, psychological, and statistical aspects to weather prediction. The contributors encompass forecasts over a wide range of temporal scales, from weather over the next few hours to the climate months or seasons ahead, and address the impact of these forecasts on human behaviour. Economic Value of Weather and Climate Forecasts seeks to determine the economic benefits of existing weather forecasting systems and the incremental benefits of improving these systems, and will be an interesting and essential reference for economists, statisticians, and meteorologists.